ARTIST IN ATTENDANCE! Q&A AFTER THE SCREENING! ►To launch its 2014 season, DIM Cinema is hosting an evening of videos by the acclaimed French artist Aurélien Froment, in advance of his first Canadian solo exhibition. Froment often uses theatrical devices and the format of instructional films to draw in the audience as participants in these cleverly-crafted investigations into the transmission of ideas. 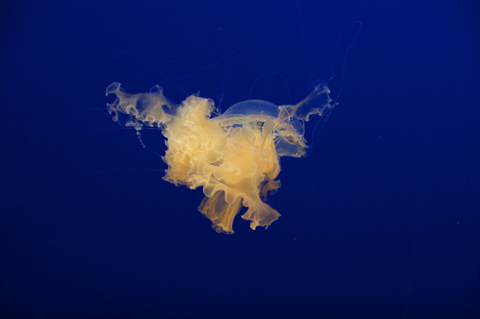 Some of the videos take a specific object or practice as subject matter — a jellyfish, a boating knot, a yoga pose — and examine it through language, revealing the elusive relationship between images and words. Others follow the shifts in perspective witnessed by forgotten historical objects as their uses and meanings change over time from those envisioned by their designers. Still others are concerned with the mental processes involved in the construction of narrative and memory. Opening Speech | 2011. HD video, colour, sound. 5 mins. Fondation | 2002. HD video, colour, sound. 2 mins. The Apse and the Bell | 2005. HD video, colour, sound. 27 mins. Pulmo Marina | 2010. HD video, colour, sound. 5 mins. Fourdrinier Machine Interlude | 2010. HD video, colour, sound. 7 mins. Théâtre de poche | 2007. HD video, colour, sound. 12 mins. Camillo's Idea | 2012. HD video, colour, sound. 25 mins. Aurélien Froment (b. 1976 in Angers, France) is a visual artist based in Dublin. After graduating from École Régionale des Beaux Arts, Nantes, he worked as a part-time projectionist at MK2 Parnasse in Paris. The cinema continues to be an important space for his practice. His work has been shown internationally in solo and group exhibitions and screenings, most recently at the ICA in London, Centre Pompidou in Paris, and at the 55th Venice Biennale. Image: Pulmo Marina (still), 2007.